Our premier downtown space is 26 acres located on the corner of Ladd and South State Street. This community park site includes two baseball/softball fields, a soccer field, access to the Willamette River, a memorial garden area, restrooms, playground, and two outdoor tennis courts. The upper shelter has 4 picnic tables, lights, and electricity upon request. Maximum capacity is 50. 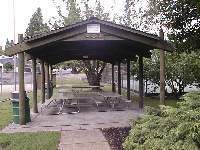 The lower shelter has 7 picnic tables, lights, 2 barbeques, and electricity is available upon request. Maximum capacity is 75. 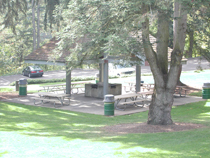 George Rogers Park is Lake Oswego's first community park and one of its most diverse. Situated on the Willamette River, the park is the site of significant Native American activity over 10,000 years ago, as well as the center of Lake Oswego's industrial iron history. The park is 26 acres and contains athletic fields, tennis courts, children's playground, picnic areas, riverfront access, walking trails, and a large natural area. 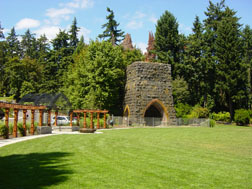 Of particular interest to history buffs is the "Iron Furnace", which is listed on the National Historic register and one of the few reminders of Lake Oswego's industrial past. 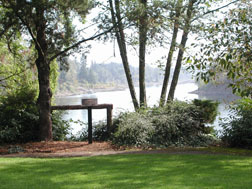 One of the best views of the Willamette River can be found near the furnace in the lower park. 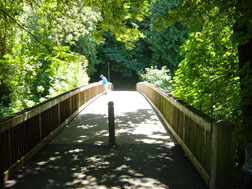 In 2005, the lower portion of the park along the Willamette River, received a much needed upgrade allowing for renewed views and pedestrian access to the river, restored landscaping, and habitat restoration fronting Oswego Creek and the Willamette River.